Spacious, comfortable and luxurious, the 2018 Chrysler Pacifica is a full-size minivan that has eight seats. This model has claimed the Family Car of the Year award for several excellent reasons. Under the hood, the Pacifica delivers best-in-class performance and handling. This versatile minivan is even available in several hybrid trims that offer industry-leading efficiency. Get details about the Pacifica's recent honor inside. The compact SUV/crossover category is littered with options, but no name stands on top like the Jeep Cherokee. Heading into 2018, Jeep made some upgrades and changes to the Cherokee model in stocking all trim packages with 17" wheels and roof rails. What's New for the 2018 Dodge Charger? For 2018, each Charger, starting with the base model, comes standard with a backup camera and rear parking sensors. 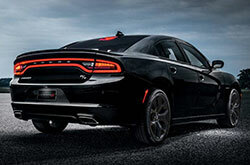 The horsepower range of the Charger is now wider thanks to the abundance in trim levels available to the market.